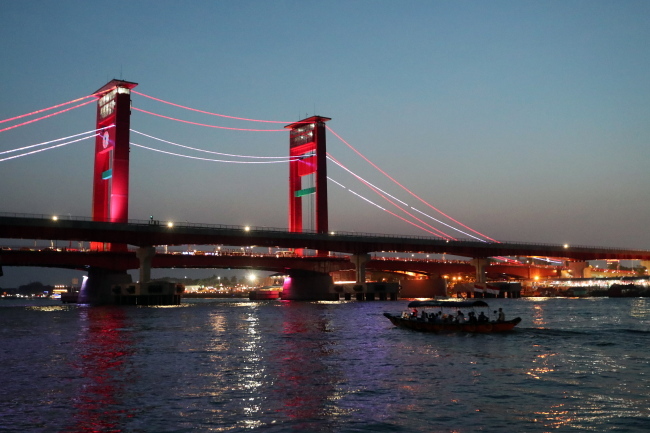 Palembang, a co-host city of the 2018 Asian Games along with Jakarta, could prove to be the promised land for South Korea, once the competition begins in earnest on Sunday. Located about 430 kilometers northwest of the Indonesia capital, Palembang will stage women's football, shooting, rowing, canoeing, bowling, tennis and soft tennis, among others. While preliminary matches in football, basketball and handball have already been played prior to Saturday's opening ceremony due to scheduling reasons, the medal race will get under way on Sunday. And South Korea's first medal could well come from Palembang. The shooting competition will begin at Jakabaring Sports City on Sunday, with South Korea's Lee Dae-myung and Kim Min-jung expected to contend for gold in 10-meter air pistol mixed event. South Korea and North Korea have put together unified teams in three events in rowing, the first of which, the men's lightweight four, will begin on Sunday. If Korean athletes don't deliver medals on the first day, there will be plenty of opportunities to do so down the road. There will also be joint Korean teams in men's and women's dragon boat racing, in which the first medals will be won Aug. 25. The women's football team is trying to win South Korea's first Asiad gold after collecting bronze at each of the past two competitions. Coach Yoon Duk-yeo's team defeated Chinese Taipei 2-1 to open the tournament on Thursday, and will take on the Maldives on Sunday. South Korea swept seven gold medals in soft tennis four years ago and will go for a repeat this time in Palembang, though there are only five gold medals at stake with the men's and women's doubles having been removed.